Students are introduced to business concepts and issues concerning the activities of a business. They explore the purpose and role of a business from spotting an opportunity through to the growth of an established business. They also look at the role of marketing and human resources. Students take a closer look at the role of operations and finance in business activity. Operations include production processes, quality of goods and services, customer service, and working with suppliers. Finance covers its role, its sources, costs, profit and loss, cash and cash flow. They also explore how business responds to external influences, such as ethical and environmental considerations, the economic climate and globalisation, and the interdependent nature of business. 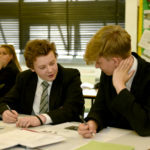 All students study OCR’s GCSE (9–1) in Business which is an up-to-date and engaging qualification that is relevant to the world of business today. This qualification equips learners with the skills and confidence to explore how different business situations affect business decisions. It is a well rounded introduction to the subject. The qualification will encourage learners to make informed choices about a wide range of further learning opportunities and career pathways as well as develop life skills that enable them to become financially and commercially aware.